In a Nutshell: As a member-owned nonprofit financial institution, Elevations Credit Union has been serving Colorado’s Front Range since 1953. The credit union has more than 120,000 members, manages more than $1.8 billion in assets, and is actively involved in community projects, including advocating for the implementation of sustainable energy resources for local households and businesses. One of the primary ways it accomplishes this is by providing low-interest, fixed-rate, flexible-term energy loans to Colorado residents who wish to make energy improvements at home or in the workplace. And it doesn’t just talk the talk. The financial institution has reduced its carbon footprint and energy consumption by 19% by implementing company-wide sustainable practices since 2004. Many electricity-generating sources are not only expensive, they require the burning of fossil fuels resulting in dangerous levels of carbon dioxide emissions. By using these fossil fuels, humans have managed to increase atmospheric carbon dioxide emissions by over a third since the beginning of the Industrial Revolution. While carbon dioxide isn’t extremely prevalent in our atmosphere’s chemical composition, it plays an important role. It’s one of the gases that blocks heat from escaping into the atmosphere, and when heat gets trapped, global temperatures rise. The result is extreme and unpredictable weather conditions that can alter the planet’s climate significantly, otherwise known as global warming. 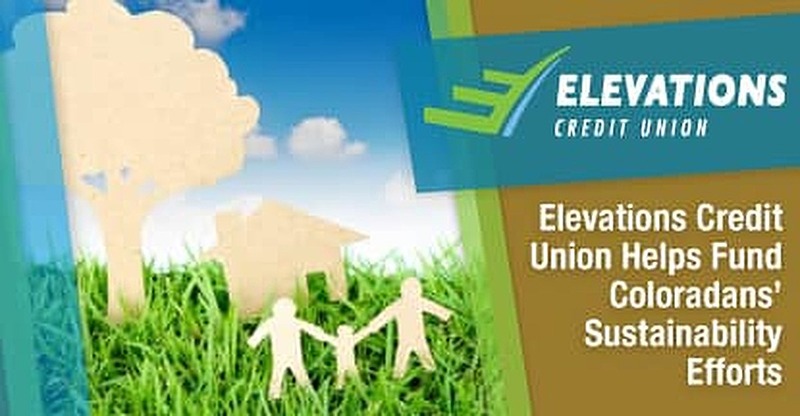 In an attempt to combat the harmful effects of these emissions and help Coloradans live more sustainably, Elevations Credit Union provides energy loans to local households and businesses that want to take advantage of the benefits of energy efficiency. The nonprofit establishment is able to provide these loans at ultra-low rates, making the process of energy upgrades more attainable to everyday consumers. Elevations’ Ray Lindley spoke with us about energy loans and the credit union’s focus on sustainability. “Our energy loan offering is perfectly aligned with our core purpose to ‘provide solutions for a better life’ as a member-owned, locally-focused financial services cooperative,” said Ray Lindley, Chief Lending Officer for Elevations Credit Union. Elevations remains committed to the long-term sustainability of Colorado’s Front Range communities and has helped support hundreds of community projects with its flexible funding and low-interest options. Sustainable best practices all begin with an awareness and understanding of how alternative energy forms can be both cost-effective and have a positive impact on the environment. For Colorado residents and businesses interested in obtaining an energy loan through Elevations, there are three different energy efficiency programs that the organization funds. These programs include the Boulder County EnergySmart Program, the Denver Energy Challenge, and the City of Fort Collins Utilities Home Efficiency Loan Program (HELP LOAN), all geared solely toward energy efficiency upgrades. “Loan requirements do vary by location and loan type. Consumers and business decision-makers can access more specific information on our energy loans site,” Ray said. The projects fund everything from air sealing and insulation, the installation of EnergyStar® Appliances, and space heating and cooling HVAC, among other projects. Fixed rates for the loans start as low as 2.75% APR and offer borrowers flexible terms, from 36 to 180 months. Homeowners can secure loans that start at $500 and range as high as $35,000, while businesses are eligible for loans ranging from $1,000 to $150,000. These types of energy upgrades save money on energy costs in the long run, and as a consumer, you can also enjoy knowing that you’re helping better the planet. Solar energy, for example, has few damaging effects on the environment when compared with traditional forms of energy that burn fossil fuels, and a natural gas space heater produces the fewest carbon emissions of all forms of space heating. By adopting the use of renewable energy forms and an energy efficiency program at home and at work, you’re minimizing your carbon footprint while contributing to a healthier and more sustainable planet. Elevations Credit Union remains committed to its environmental efforts by adopting sustainable practices throughout the organization. To minimize waste, it employs a recycling program, which includes paper, aluminum, and cardboard. Additionally, all facility upgrades or builds use durable, recycled materials that are manufactured locally whenever possible. The company also conserves resources by using natural elements and technologies to reduce operational costs and minimize pollutants. The institution is highly conscious of its place within the community and maintains a deep sense of responsibility toward the environment. Elevations is committed to using environmentally friendly products and ecologically sound materials in all of its business practices and has been engaging in these conservation efforts for more than a decade. Remaining active in the Colorado community by holding regular events and seminars is one of the many ways that Elevations Credit Union helps to raise environmental awareness and improve financial literacy. Seminars cover a range of topics, including how to adopt a clean energy program at home and how to cut energy costs for your business. Community events are often accompanied by live entertainment, local farmers markets, and fun family activities. These events and seminars bring the community together and benefit consumers, businesses, and students who want to learn more about how they can help the environment and save on energy costs. They’re also great venues for real estate agents who want to enhance their portfolios by appealing to buyers interested in clean energy homes and properties. With over 500 energy loan projects processed totaling more than $5 million, it’s easy to see why Coloradans look to Elevations Credit Union to finance their energy projects. The Front Range community is coming together in an effort to make a difference in their environment, while borrowing from other members at very low interest. The long-term health of the planet is at risk if folks don’t continue to step up and adopt more environmentally friendly practices at home and work. Elevations Credit Union knows that by offering the funding for its members to turn to sustainable and renewable forms of energy, Coloradans are saving money while helping the environment.